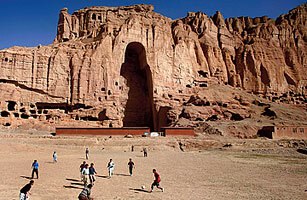 If you've heard of the Bamiyan Valley, chances are it will be because its two famous landmarks  the largest standing statues of Buddha in the world  were blown up in March 2001 by the Taliban, who considered them un-Islamic. The ancient statues were Afghanistan's most important historical monuments, and for a time their senseless destruction made the valley internationally synonymous with fanaticism and war. But not many people know that since the fall of the Taliban at the end of 2001, Bamiyan, deep in the Hindu Kush mountains, has become a relatively safe enclave in an otherwise still violent land. Even as President Bush dispatches U.S. reinforcements to the country, some are seeing Bamiyan as the place where a once thriving tourist industry might be relaunched. In that respect, Hiromi Yasui, a 42-year-old Japanese photographer turned hotelier, is a pioneer. She has built a hotel on the valley floor, directly in front of the cavernous recesses that once housed the Buddhas. "Now that there is peace, everyone wants to come back," she says, believing that tourism can be grown to the levels experienced before the Soviet invasion of 1979. "Everyone" is an exaggeration  insurgency still rages throughout Afghanistan's south, and most countries warn nationals against visiting  but Yasui has no problem filling the 10 rooms at her Hotel Silk Road Bamiyan, www.silkroadbamiyan.com. Aid workers, contractors, journalists and the occasional intrepid tourist flock to the hotel for weekend getaways and a taste of tranquility that is difficult to find elsewhere in the country. Each room offers comfortable beds, spotless bathrooms and panoramic views of the valley and the cliffs, which are honeycombed with caves. If you're used to luxury, you might find the Silk Road hotel a little plain, but the truth is the rooms are among the finest in Afghanistan (only the five-star Serena Hotel in Kabul can better them). Besides, you get the bonus of the owner's company. Yasui first went to Afghanistan in 1993 as a freelance photographer. She eventually fell in love with the country and with an Afghan, who became her husband and helped her realize her ultimate dream, which was to open a hotel. "In Afghanistan they never think of guests as trouble," she says. "Even when they have nothing they share it. So I came up with the idea to open up a hotel to offer the same kind of hospitality." After four years of construction and shipping every item from mirrors to chairs and pillows over the 110-mile (180 km) unpaved road from Kabul, Yasui opened her doors in May 2007. Her commitment to hospitality is very much in evidence. Most evenings she presides over the kitchen herself, whipping up favorite recipes from across Asia. If she is not showing visitors her favorite walking trails through the valley or overseeing the cleaning staff, she can usually be found in her office, putting the finishing touches to the gift-shop items she commissions from a local women's cooperative. "I love Afghanistan and I love the people," she says. "I can see myself spending the rest of my life here." Sitting up on her rooftop early one evening, she gazes at the empty Buddha niches painted golden by the setting sun. "Bamiyan has always been a tourist destination," she says, referring to the Chinese pilgrim Faxian, who first wrote about the valley in a 5th century travelogue. If Yasui has her way, it will be one for a long time yet.